The Plexidor collar and radio frequency key opens doors for pets. Pet-sized doors, that is. This helps dogs from getting into deep doo-doo because of holding things in too long. The system is two-way and the animal can go in and out using the same clip-on-collar key. Each key can hold an RFID (Radio Frequency Identification) chip and the double-doors swing open or shut only when they recognize that chip. RFID chips require no batteries and can have different codes. A sensor in the door reads and recognizes the right code as the pet approaches the door. Another sensor prevents the door closing while the pet is still in the doorway. Prices start at $129, but quickly run up to around $300 for any decent size. 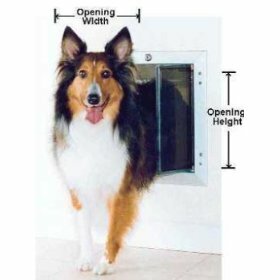 See dogdoors.com or Amazon.com for more info.